This entry in the Why This Book Should Win series is from Ruchama Johnston-Bloom, who writes about modern Jewish thought and Orientalism. She has a PhD in the History of Judaism from the University of Chicago and is the Associate Director of Academic Affairs at the London center of CAPA: The Global Education Network. There is a certain amount of fatigue, I think, with Holocaust narratives. People may feel that they already know what to expect, they know the story, they do not need to revisit that world. This despite, or perhaps, because of, the recent Claims Conference survey, which found a significant lack of knowledge about the Holocaust in the United States. 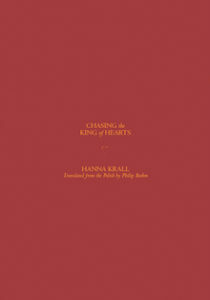 Whatever disinterest or trepidation you might feel when faced with the prospect of returning to this horrifying terrain, Chasing the King of Hearts by Hanna Krall, translated by Philip Boehm, is worthy of your attention. This slim volume (originally published in Polish in 2006) is Krall’s account of the life story of Izolda R., a survivor who spent the war restlessly, relentlessly trying to reunite with her husband. Her single-minded quest sends her throughout occupied Poland, Austria, and Germany, in and out of camps and prisons, and back and forth between passing as a non-Jewish Pole and being hunted as a Jew. The author and the subject clashed over how the story should be told. As Krall has stated, Izolda R. was “sentimental, wordy, emotional, always wanting it bigger. I have always known that the only way to tell such a story is with austerity and great emotional calm, even detachment.” The marriage of Izolda’s almost preposterous true story of survival and Krall’s laconic style gives this book its power, and, of course, draws our attention to the thorny relationship between history, memory, and truth, and between fact and fiction. With her almost aphoristic approach Krall constructs vignettes that capture Izolda’s scattershot movements throughout the Reich and illustrate how factors like gender, language, and class shaped her experiences. I found Krall’s foregrounding of gender particularly fascinating (it is fitting that the Feminist Press brought this U.S. edition out.) Language is also a compelling through line—particularly Izolda’s inability to fully share her experiences with the younger, Hebrew-speaking generations of her family. And class also—Izolda cannot do the menial tasks she is often required to perform as a prisoner because she never had to do them before the war. When she encounters Austrian Jews being deported, they are convinced they are better than Polish Jews and will therefore be treated better by the Germans. The vignettes Krall constructs capture the dark truth of the Jewish experience of trying to pass—Izolda recites the Hail Mary perfectly, only to be told an actual Catholic wouldn’t bother to enunciate each word so clearly. They also reveal identity as something both terrifyingly fixed and strangely fluid in the landscape(s) Izolda traverses while trying to find her king of hearts. Jewish women die their hair (Izolda at one point ties a bit of torn-out coat lining around her head to hide her roots), men have surgery to elongate their foreskins, teeth (real and false) are knocked out, false teeth are then removed preemptively ahead of beatings . . . There is ultimately no escape from being Jewish—even after the war she and her husband try to pass and fail, eventually having to leave Poland—but there is also a strange sense that everything is malleable. Old photographs can be doctored; concentration camp numbers can be removed or amended. If there is a “Jewish way” of holding a bag, then there must be a way to learn how to fully inhabit the other, the non-Jew. A way to escape. she wouldn’t have travelled to Vienna. If she hadn’t gone to Vienna, she would have stayed in Warsaw. She would have died in the uprising, in the basement, together with her mother. If she hadn’t escaped from Guben, they would have sent her on with the other women. in the middle of a typhus epidemic. She would have died of typhus together with Janka Tempelhof. Evidently God had decided she was meant to survive the war. Or not. He had decided that she was meant to die and she opposed His verdict with all her strength. That’s the only reason she survived. And no God can claim credit. It was hers and hers alone. Izolda’s journey, mapped by Krall and Boehm, circles back to contingency again and again. How did Izolda survive? Why? Is there any meaning to this survival? Izolda is convinced her love for her husband propelled her forward, but he seems to not fully reciprocate that love, and the love story does not provide much by way of explanation or closure. Near the beginning of Chasing the King of Hearts, Izolda wants to witness one of the typhus patients she is tending die because she is curious about “what she might see when someone else’s life comes to an end.” She wonders if she will see a sign, “because if there is a sign, it ought to be read.” Izolda continues to look for signs throughout the book: using a pack of cards to help locate her husband, wondering if it is a good omen when she sees someone wearing a sweater like one that belonged to a friend who escaped to Honduras. Chasing the King of Hearts is a book full of signs—signs that it may be impossible to fully interpret, but that we ought to read nonetheless. Tickets to Open Letter’s Ten-Year Celebration in NYC Are Going Fast!